I don’t see anything about these latest developments on the Mill Towns Trail news page nor the Mill Towns Trail Board site but then, I’ve whined about that before to no avail. What a great contribution! Rotary and the J.J. Tour provide so much to the community! It will also be a great access way to the proposed transit hub. In today’s Nfld News: Spiraling costs may mean rerouting trail in town. The Nfld News criticizes the citizens and officials involved with the Mill Towns Trail in today’s editorial: Mill Towns Trail section needs work. trail’s growth, could see this coming. One would think the best way to connect the trail would be to run it across the private property through the driveway between the old Mr. Movies and Just Food, connecting it with Water Street. This would be an inexpensive option (cheaper than going behind the properties. However, this involves the property owners, who do not want to have anything to do with it. This is going to be a costly undertaking for several hundred feet of trail with a very pleasant view of trash dumpsters, and smelly Chinese food. Even if we get the trail in, we are going to need to do something about the appearance of the backs of these buildings. This design problem should be taken to the Park and Rec Advisory board; we have three very highly trained and experienced professionals there(and a bunch more members who are very informed) who could undoubtedly come up with the best idea:Spencer Jones, internationally known landscape designer, Nathan Knutson, internationally known architect, and Dennis Easely, Carleton’s own landscape management guru. When the staff cannot come up with a solution that is obvious, it’s time to go to the design specialists, whom we are so fortunate to have on our citizen board. This is beyond just the engineering or property logistics; it needs some experienced, creative thought applied. Just one more reason why we should be paying MORE attention to our citizen advisory boards and commissions, not trying to cut them back. Healy Construction was onsite this week gearing up for delivery of the bridge structure. At this time the cranes required to set the bridge are scheduled to arrive early next week. The bridge will arrive shortly after. The bridge will be delivered in 5 sections and reduced to two sections once onsite. The two sections will then be lowered on the abutments. The contractor has 60 working days to complete the project. By contract the work should be completed mid-July depending on weather. I’ll see if she can comment about the problems with the portion of the trail that will connect the bridge to 5th St. and Water St. 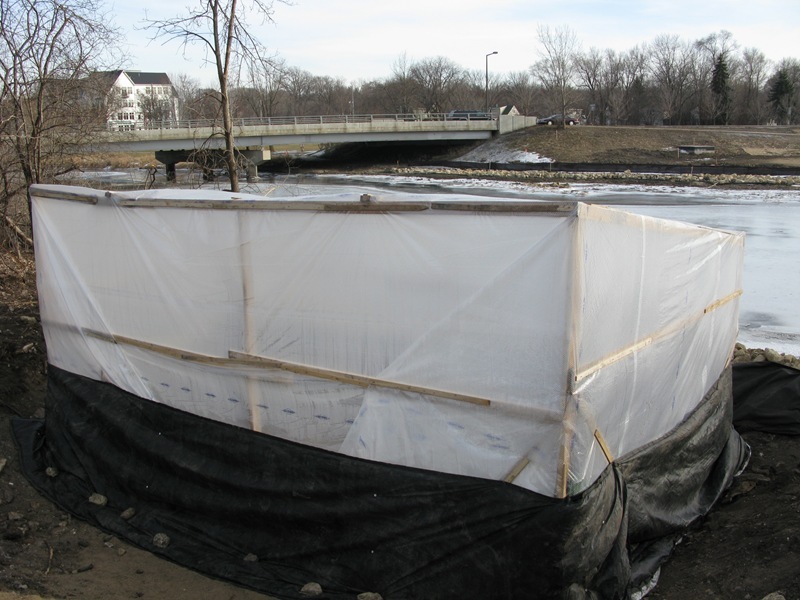 The work to conduct a hydrologic analysis of the construction of the Riverside Trail connection located within the flood way of the Cannon River has begun. The results of this effort should be available to staff in the next 3 to 4 weeks. Once staff reviews this information, the process of issuing a conditional use permit as set forth in the flood plain regulations of the city will begin. Still no word on how they’re going to solve the problems around the portion of the trail that will connect the bridge to 5th St. and Water St.
Griff has asked me if I have any updates on the trail connection from Riverside Park to 5th Street. I’m afraid I have no newer information than what Brian O’Connell has been quoted as reporting in post #8. However, when firmer plans and estimates come back to the council I will try to make sure you are informed. My understanding is that all of the land/building owners rejected the opportunity to have the trail come through their property, but at least we asked one more time. The bigger issue is going to be how we prioritize all of the projects in the pipeline (trail connection, widening the sidewalk on 5th Street bridge, potential Skate Park Plaza, kiosk at the corner of 3 and 19, additional improvements downtown…), and figuring out where Master Development funds can/should be used and when they come available. To that end, the Mayor’s Streetscape Taskforce will reconvene in the next few weeks and will tackle some of these issues. The group will consist of building owners, business owners, NDDC folks, and interested citizens. So they will be a helpful resource as the council moves forward. On the topic of the new bridge across the Cannon, it looks like, weather permitting, that the big day is Monday! With three cranes on the clock, it would take a heck of a storm to postpone this project. So get your cameras charged up! I believe the City is planning on documenting this installation as well. After the “erector set” pieces are connected there is sill much work to do, including pouring a concrete deck, so it will be a while before the bridge is open to the public, but it will be an exciting project to watch over the next few weeks. I’ve rarely seen Peggy Prowe so excited as when sharing recent photos from the project at Rotary last Thursday! Mary, please have the Mayor’s Streetscape Task Force include the topic of downtown bike lanes in its analysis. I refer them to the Parks, Trails, and Open Space Master Plan; the map is online with the plan, which will tell them which portions are downtown. It’s also possible that Rotary may be a resource to help fund bikeway improvements, given their stewardship of the J. James Bike Tour. Thanks for the update, Mary. ‘Twould be nice to get more details from City Engineer Katy Gehler-Hess. She had a two-paragraph update on the bridge in the 4/24 Friday memo but nothing about this issue. Bill, glad you brought up the issue of street bike lanes for the trail’s route through Northfield. It seems odd to me that this isn’t settled yet. The MTT website has no info, either.